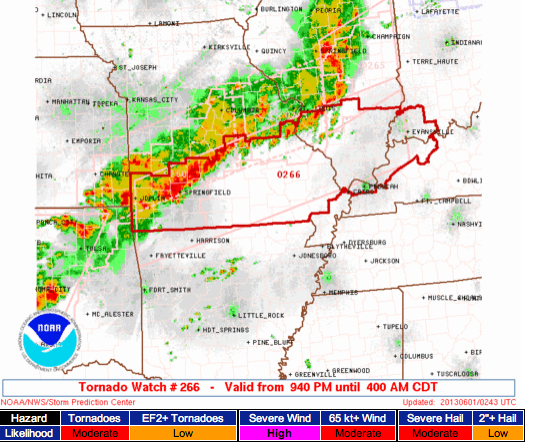 ...in the St. Louis, Oklahoma City, Joplin, or other tornado situations, just scroll back through the blog to 4pm this afternoon. You'll find complete coverage of each. Some start expiring at 10pm. Both of these in effect until 10pm. 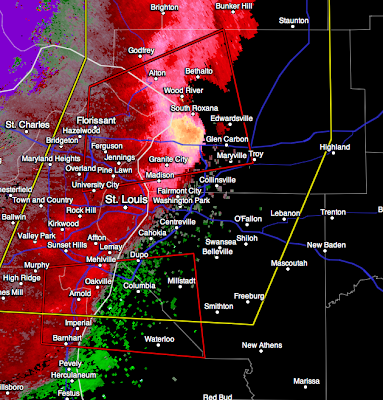 Coverage of this event began on this blog and on AccuWeather's affiliate KMOX Radio in St. Louis yesterday. 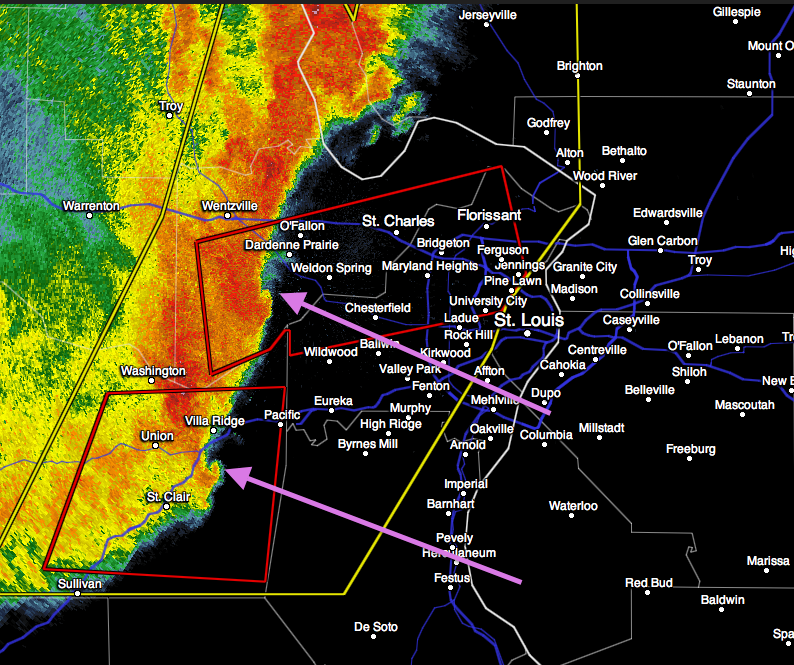 I was on KMOX calling for "one or two tornadoes" twice this morning. There were multiple updates on the blog today focusing on Oklahoma and Missouri. I have been live-blogging since 4pm. My fingers are extremely sore. 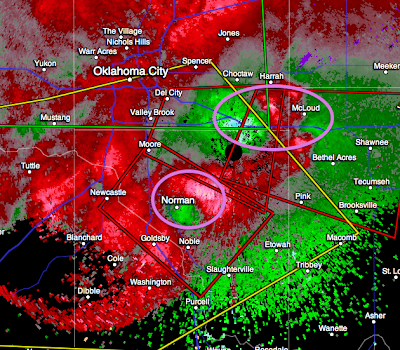 I have tried to cover all of the tornado threats when The Weather Channel and others were focusing exclusively on OKC. 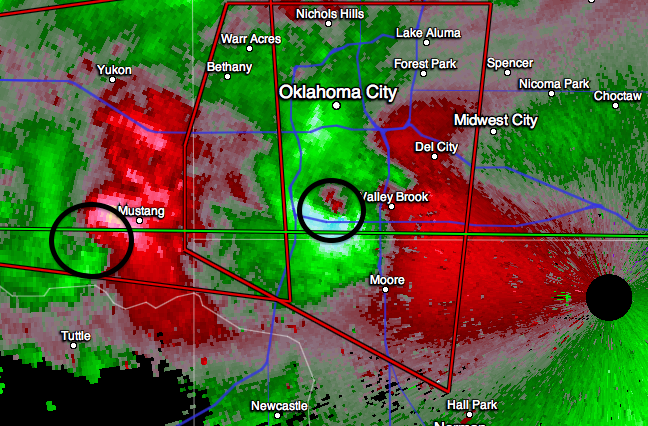 There is serious damage in the St. Louis and Oklahoma City areas and we know there are injuries. 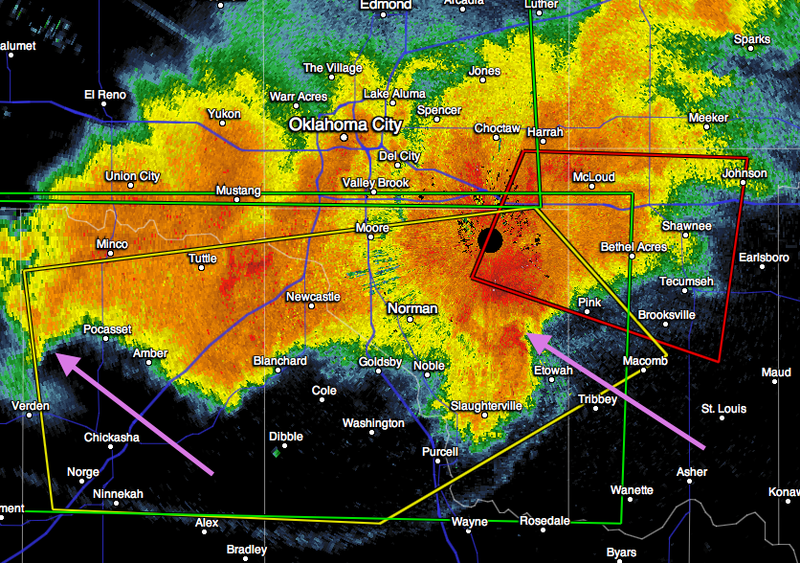 There are also multiple reports that fatalities have occurred in Oklahoma. So, I have to stop for the night. I hope this coverage has been helpful in keeping my readers safe. 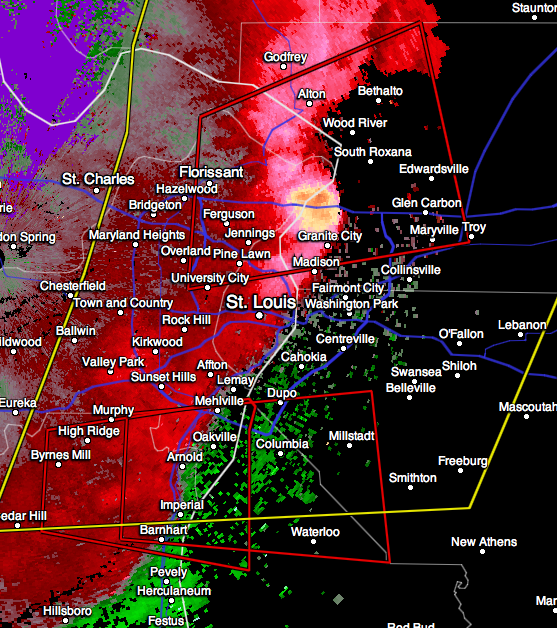 Injuries and damage reported in St. Louis Metro. 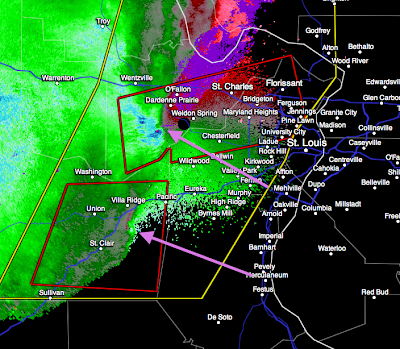 Ground stop at St. Louis Lambert Airport. Red polygons are additional tornado warnings in Illinois. 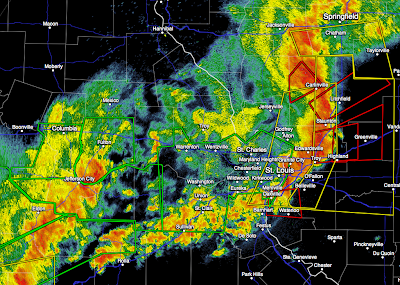 Note the second line of thunderstorms from Fulton to Jeff City to Lake of the Ozarks. 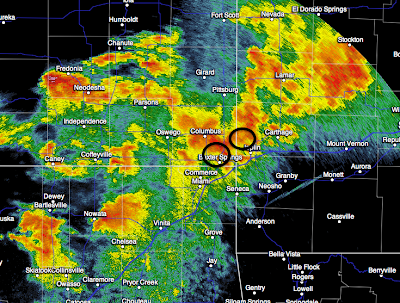 This will bring more heavy rains. Serious river flooding and flash flooding is likely. 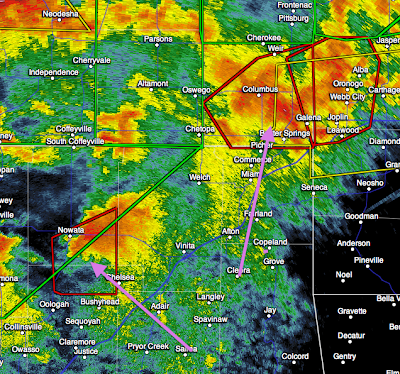 Possible tornadoes located near Lake Thunderbird moving toward Pink. Another tornado near Pocassett moving toward Amber. Major flooding likely due to continuing rainfall. 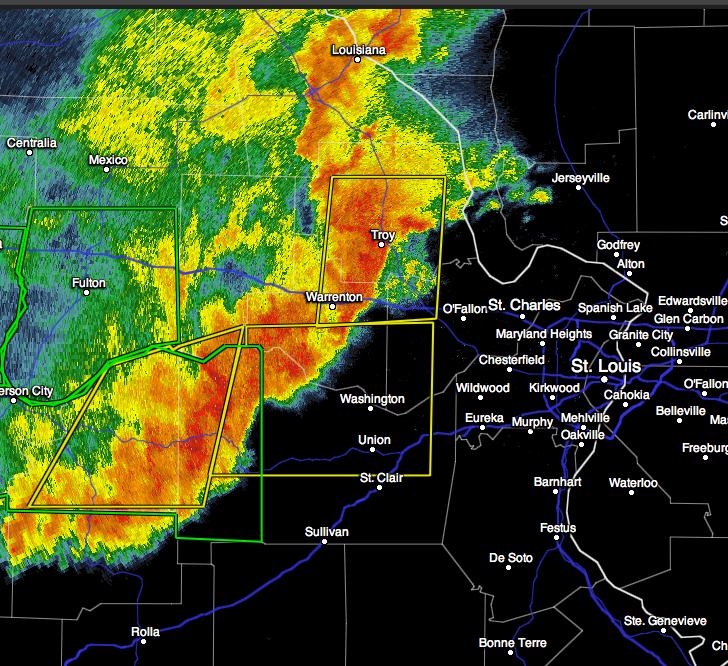 Flash flood warnings in green. 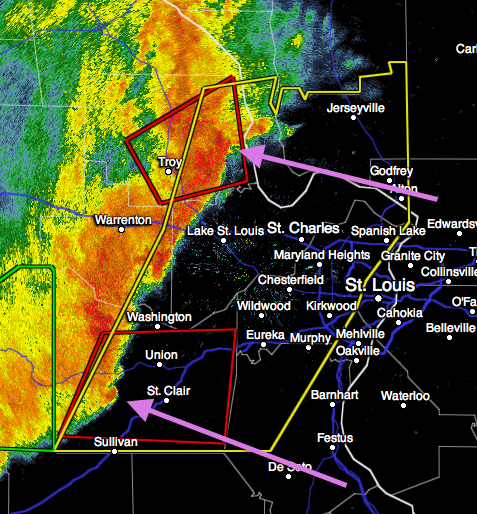 Damaging winds and flooding likely with these storms. One threat near Carl Junction with a bigger threat west of Joplin. South Roxanna, Edwardsville, TAKE COVER! 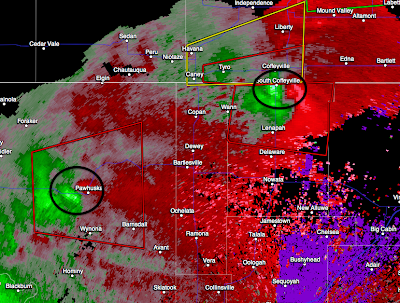 Two tornadoes indicated at 8:27pm including Wood River - Edwardsville and Arnold - Oakville -Columbia, IL. 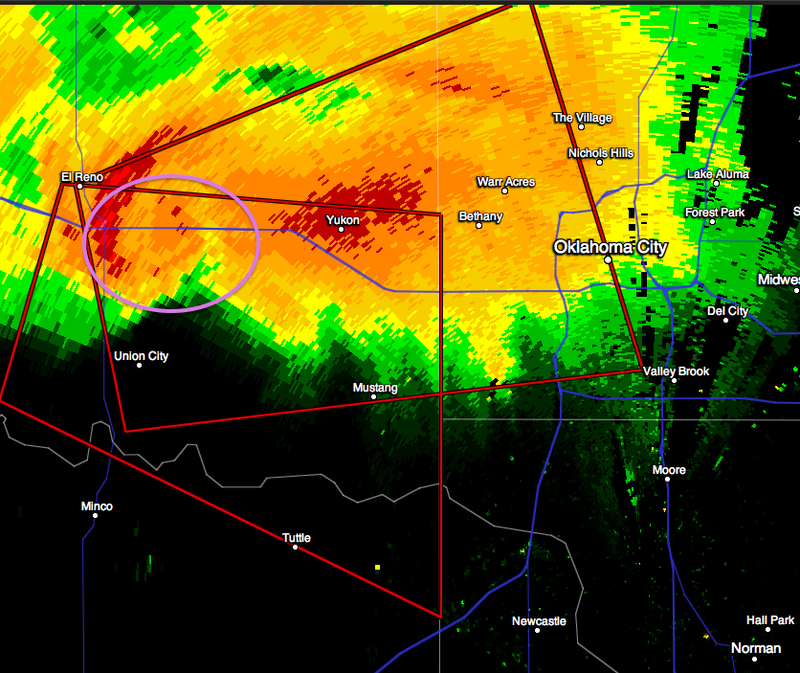 Most likely location of tornado is west of Carl Junction. 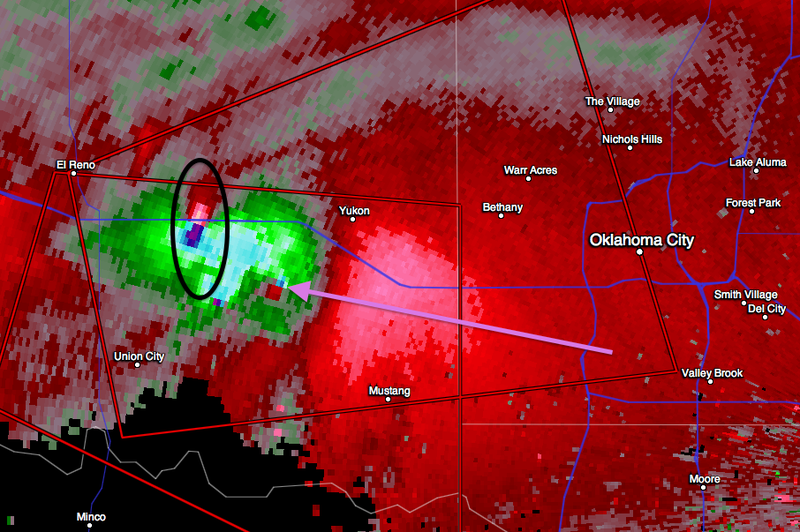 One tornado just past Lambert moving toward Furgeson. All of north county should take cover! 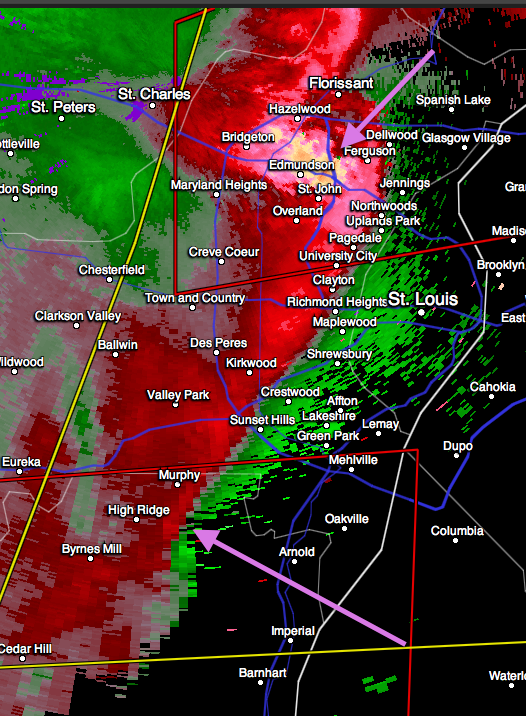 Second tornado moving toward Arnold and Oakville and Melville. 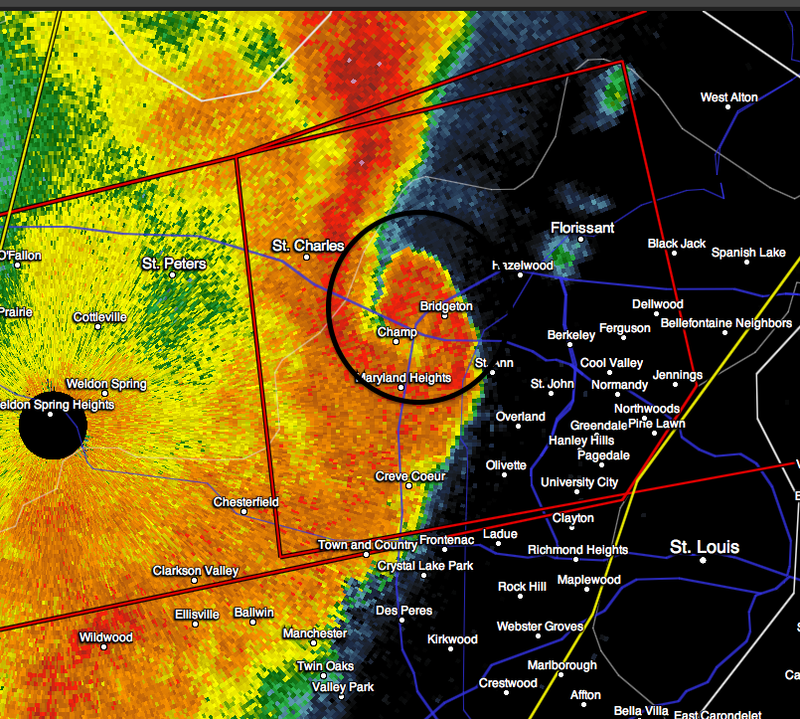 UPDATE: 8:14PM: Tornado just about over Lambert. Moving E to ENE. 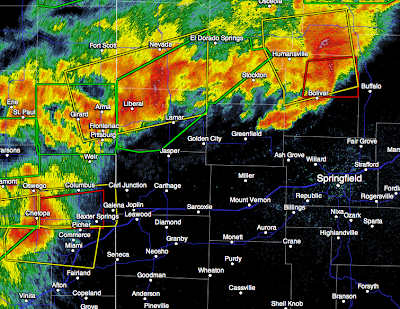 8:11pm Radar. DAMAGE CONFIRMED. 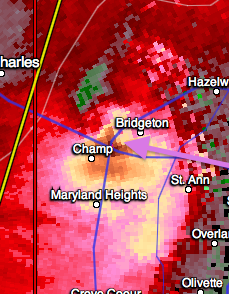 Tornado now in Bridgeton-Lambert-Hazelwood-St. Ann area. 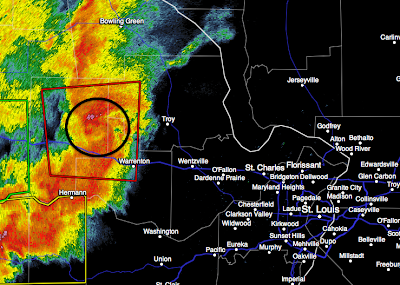 Tornado moving toward Florissant, Berkeley and Ferguson! 8:06pm radar! Click to enlarge. 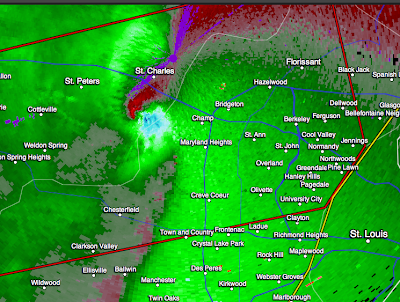 Tornado crossing Missouri R. south of St. Charles. 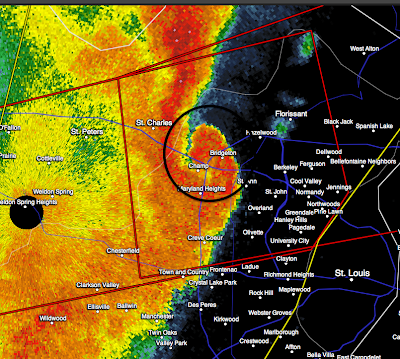 Tornado moving into Champ, Lambert, Bridgeton, St. Ann, Maryland Heights, Berkeley. Take cover now! 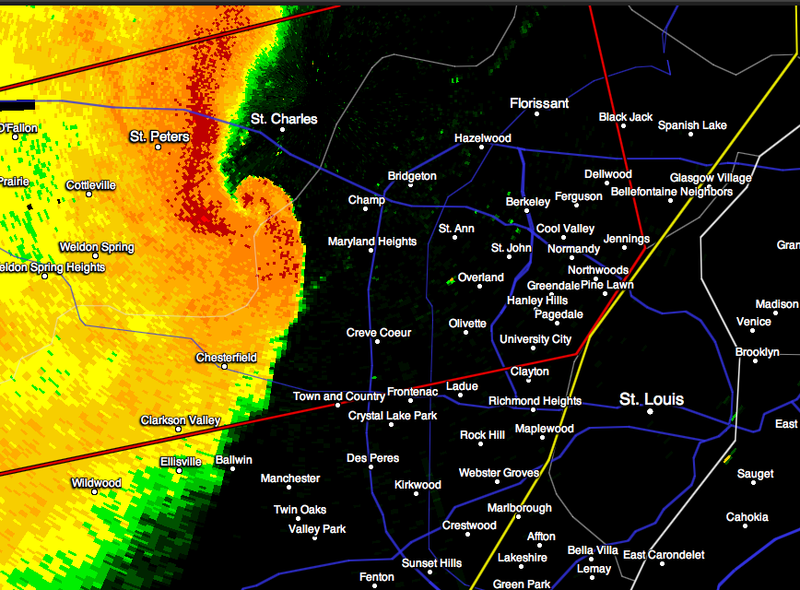 This tornado is confirmed! Click to enlarge. 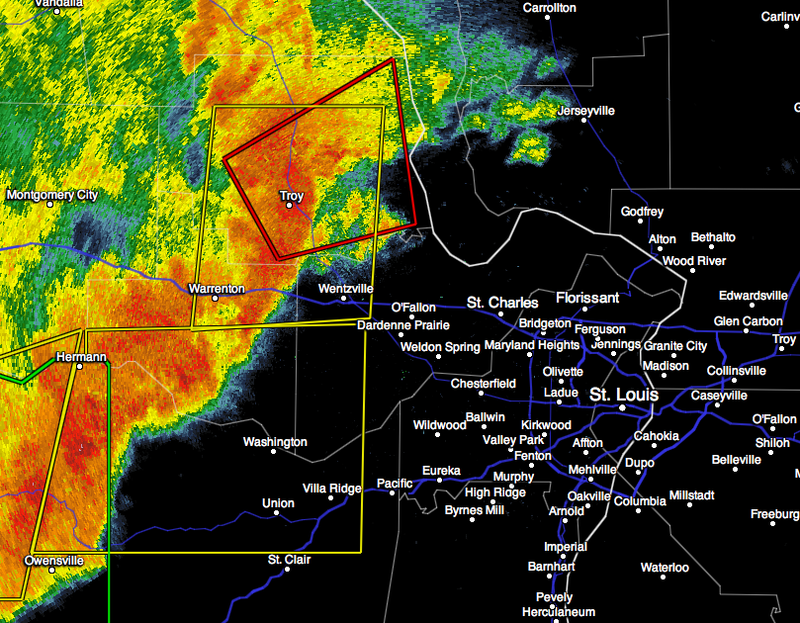 Red polygons = take cover. 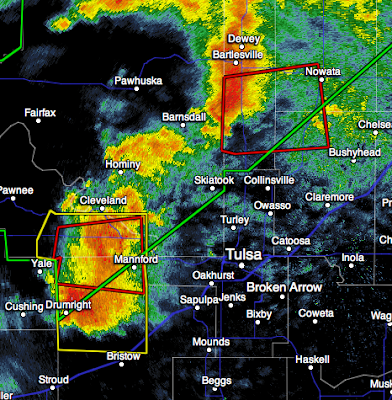 Southern cell is moving toward Tulsa. 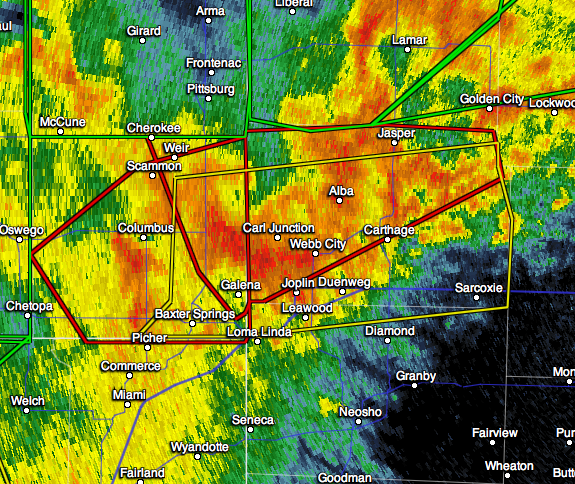 Baxter Springs and Columbus, KS are in a tornado warning. 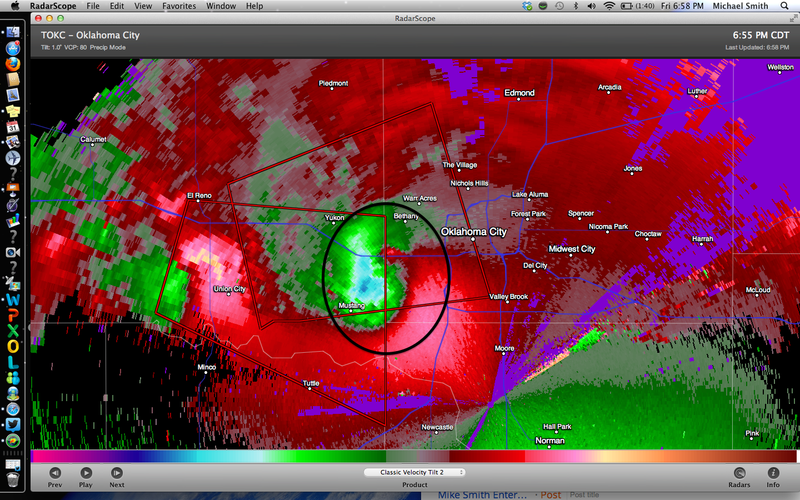 This is just west of Joplin. 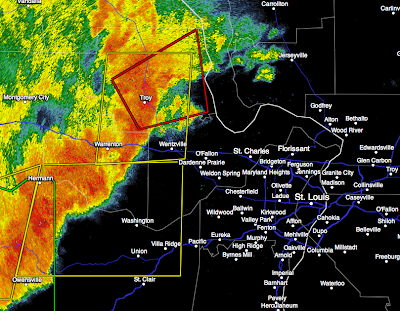 Second warning near Bolivar. 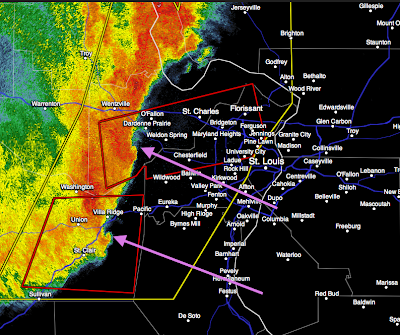 Take cover these areas!! Two tornadoes indicated at arrows. 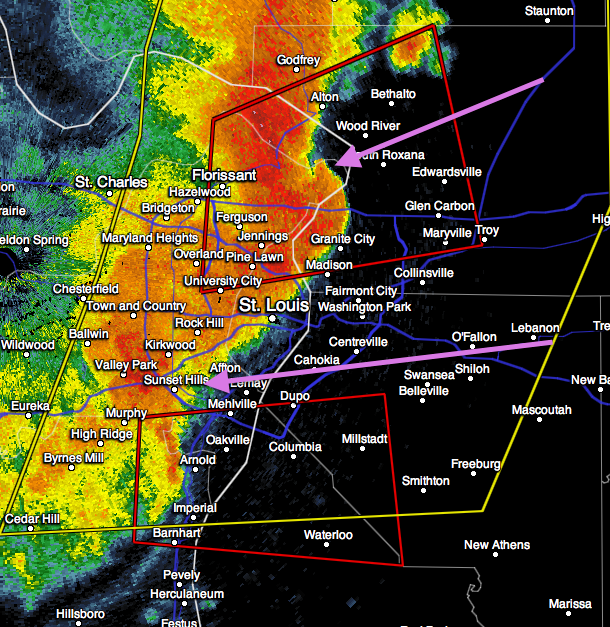 Take cover in red polygon areas! The Weather Channel is factually incorrect when they report the radar is at Lambert. 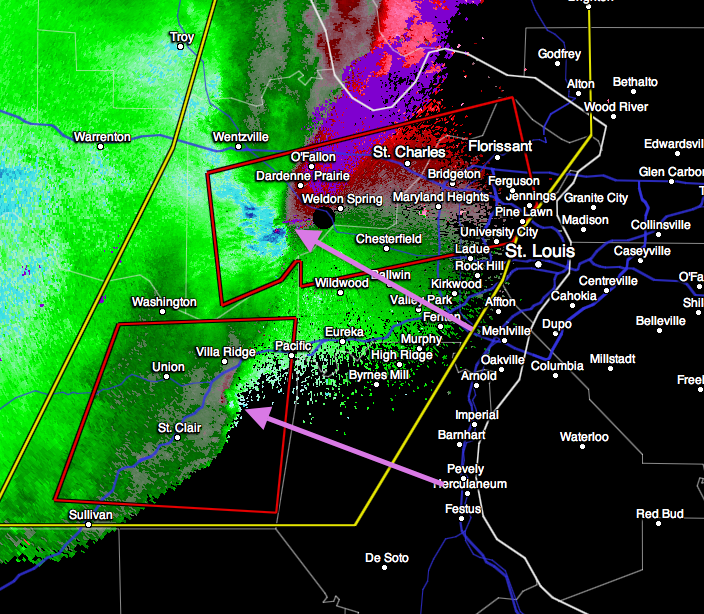 The radar is at Weldon Spring. 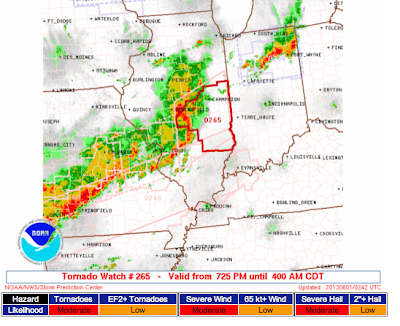 NWS office co-located with radar. 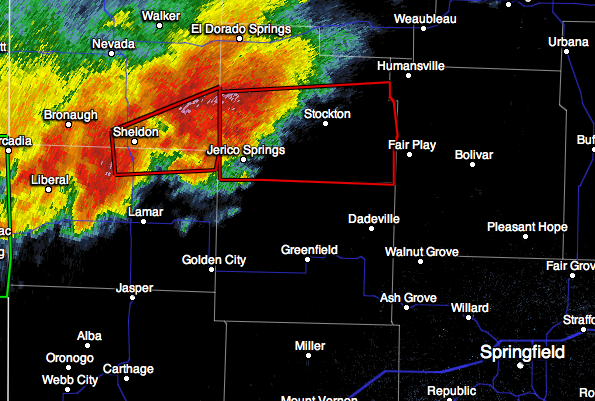 NWS in Weldon Spring has taken shelter! 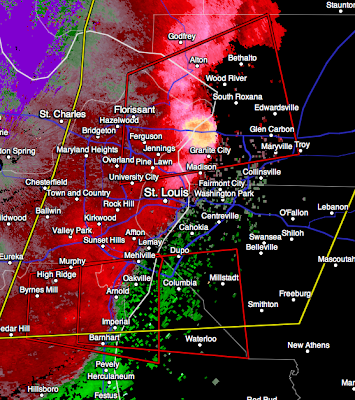 One tornado moving into Weldon Spring then Chesterfield and Creve Couer and Maryland Heights and second toward Pacific+Eureka. Then High Ridge, Murphy and Byrnes Mill. Click to enlarge 7:50p images. 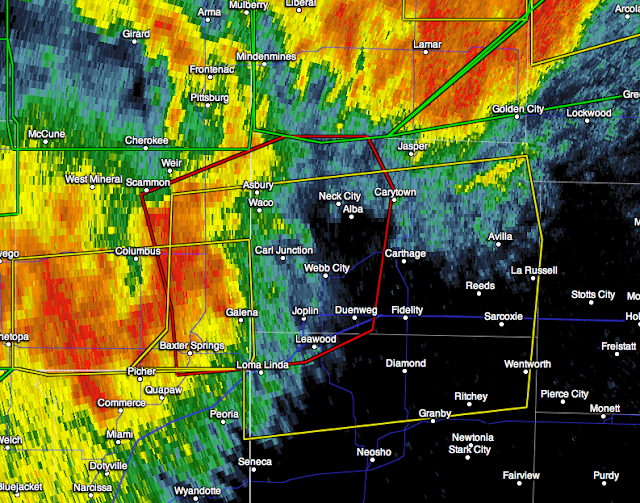 Tornadoes west of Union City headed toward Union City and Minco. 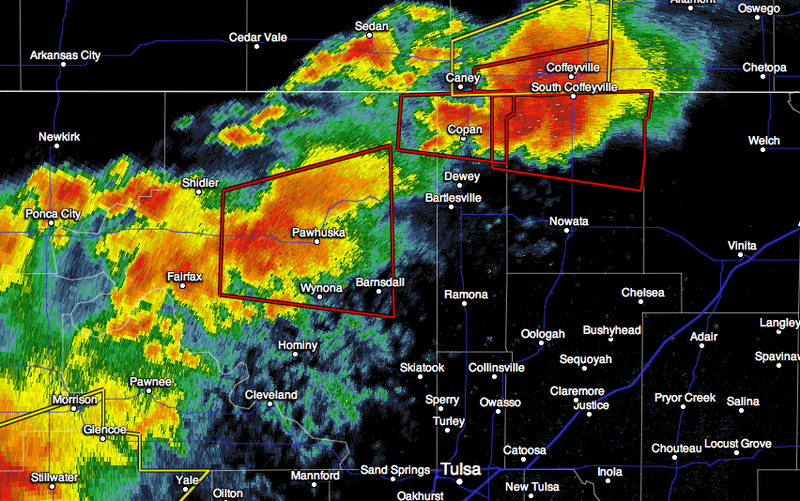 Tornado northeast of Tuttle moving E to ESE. Tornado west of Moore moving E to ESE. 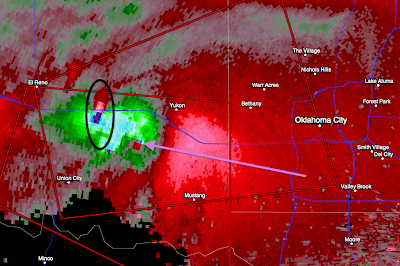 Tornado in the Del City area moving to south of Midwest City/Tinker. 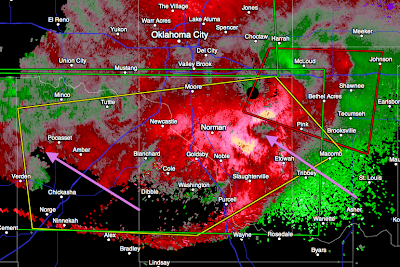 7:47pm: There is a moderate circulation near the west edge of Moore moving ESE to SE. 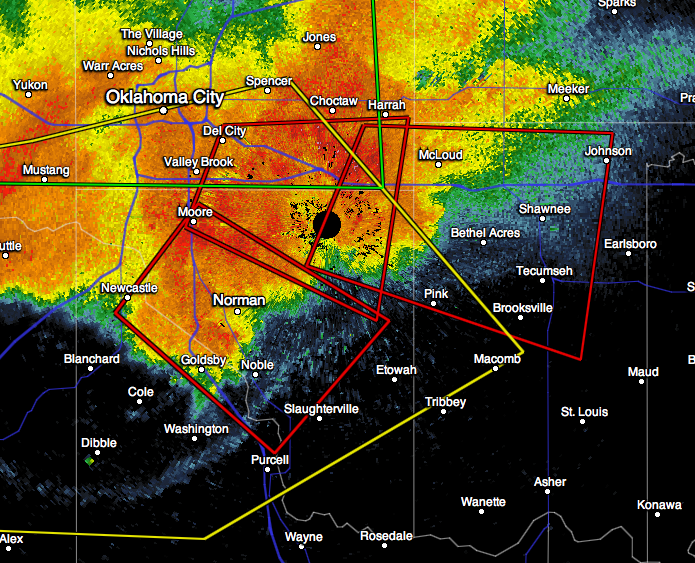 Moore is under a tornado warning. 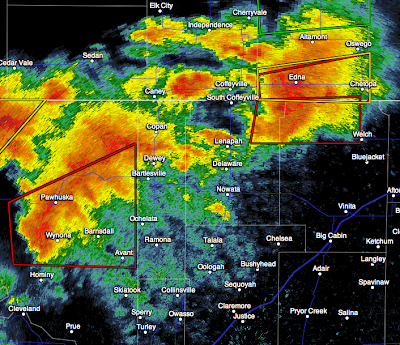 Please continue tornado precautions! 7:49pm: The Moore-area circulation is now headed for Norman and especially north Norman. The circulation south Del City is now moving southeast toward Draper Lake and the Twin Lakes Radar site. 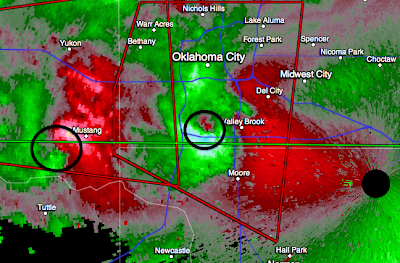 Two tornadoes in the area. 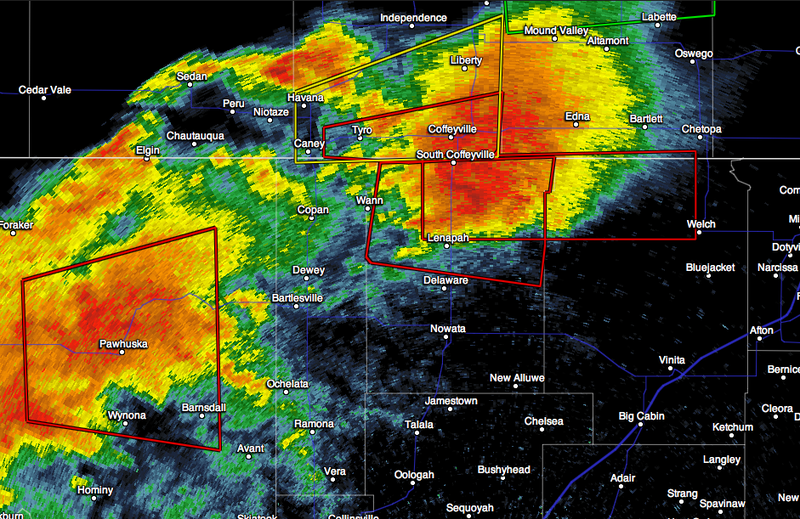 Two tornado warnings. 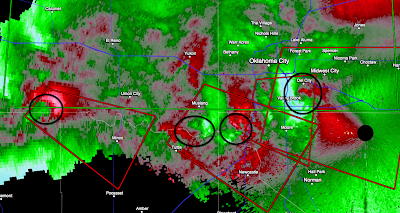 Tornado locations at arrows. Take cover in both polygons. 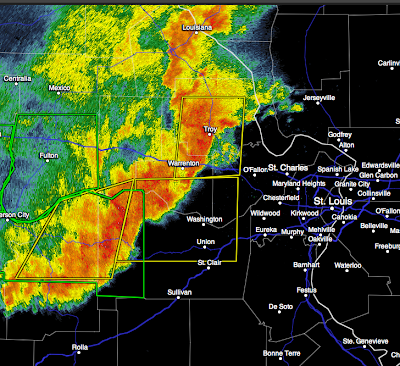 Severe thunderstorm warning for entire Missouri area including STL County. 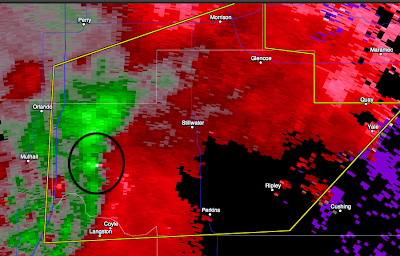 Damaging winds likely. 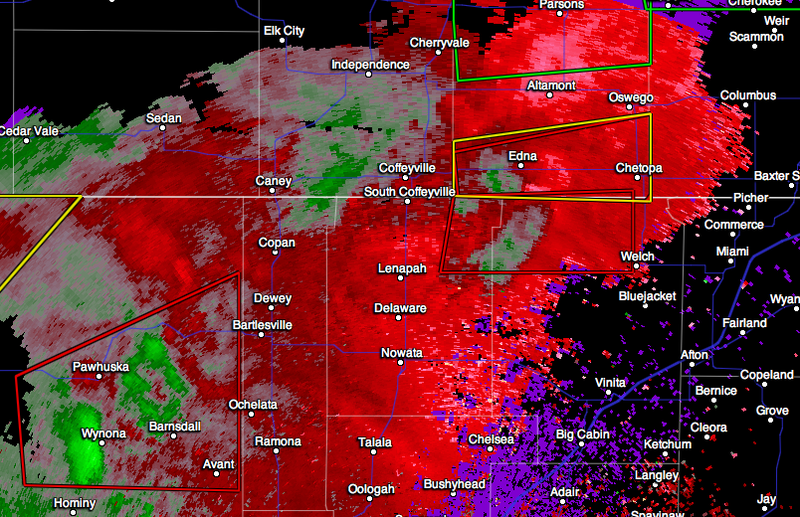 High tornado danger near Edna, Kansas moving ENE. 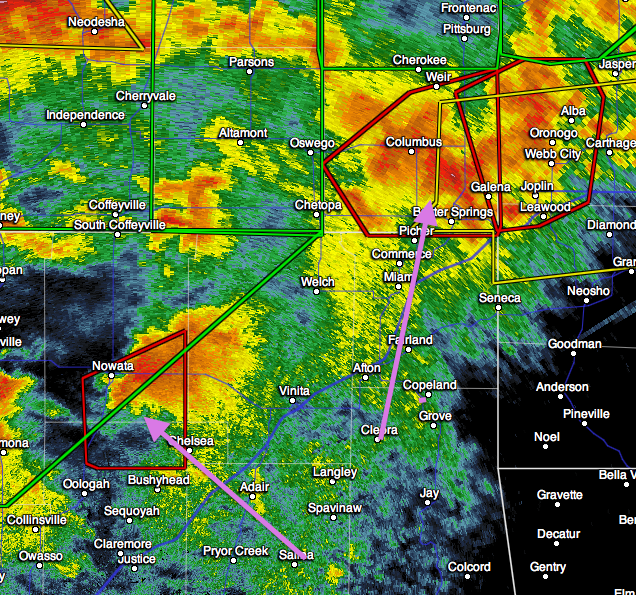 Tornado warnings continue in both areas of red polygons. Take cover!!! 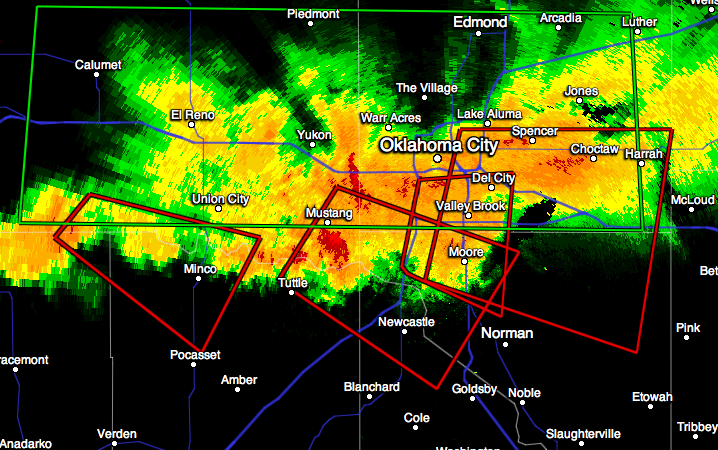 Third tornado threat near Minco, OK.
7:24pm Radar: No question there are tornadoes circled. 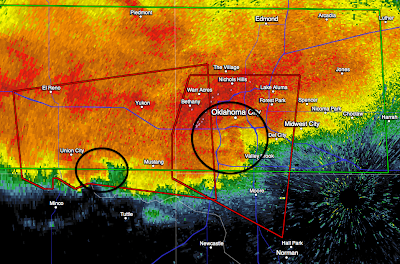 One is near and just north of I-240 in south OKC moving right at Valley View. The second is just west of Mustang. Power flashes reported seconds ago in south Oklahoma City - Valley View area with Del City - Tinker - Midwest City in the path. Second tornado farther west between Mustang and Union City moving generally toward Mustang. Damaging winds and some hail moving into St. Charles and into Washington - Union areas. Stockton, MO and entire red polygon take cover now!! Click to enlarge. Take cover in red polygons! 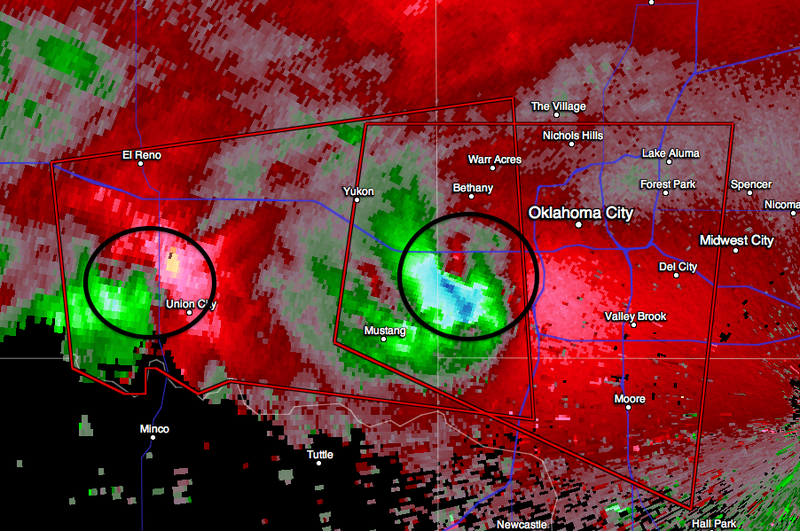 7:04pm Radar: Both tornado locations circled. Click to enlarge. 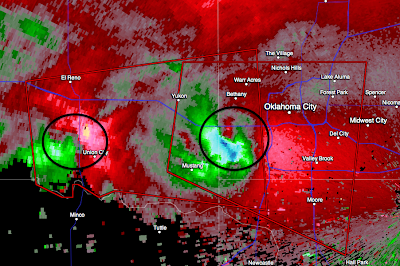 7pm radar: Two tornadoes circled. Tornadoes moving east to ESE. 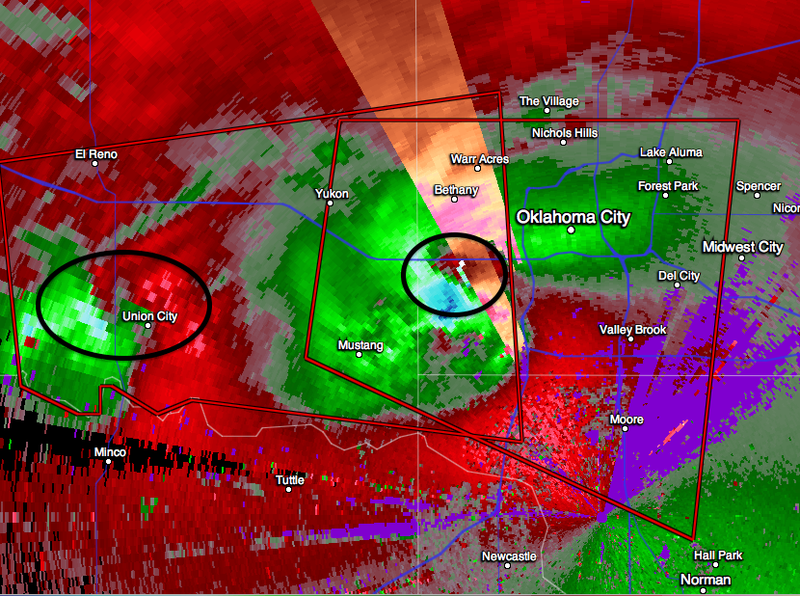 Lillard Park, Fairgrounds, Downtown OKC, Will Rogers Airport in the path of the tornado circled. There is a second tornado indicated near Union City. 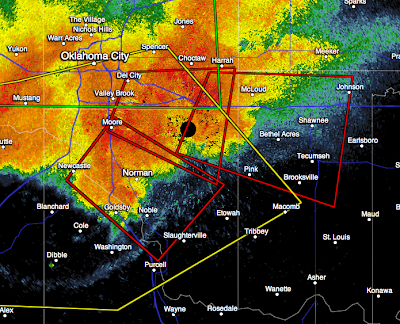 Southern Oklahoma County, northern McClain and northern Cleveland Counties TAKE COVER NOW!! 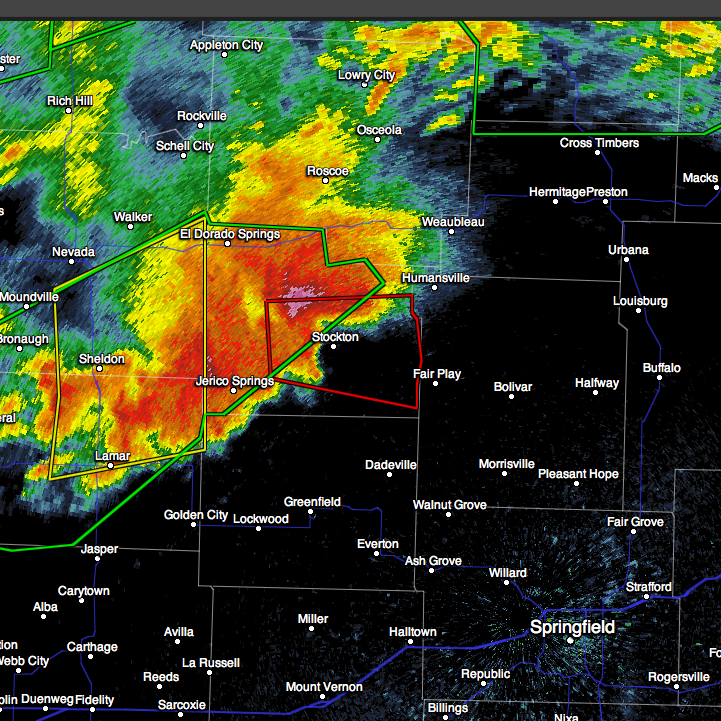 Coffeyville, Kansas take cover. Copan and Pawhuska, OK take cover! If you are in the red polygons, take cover!! 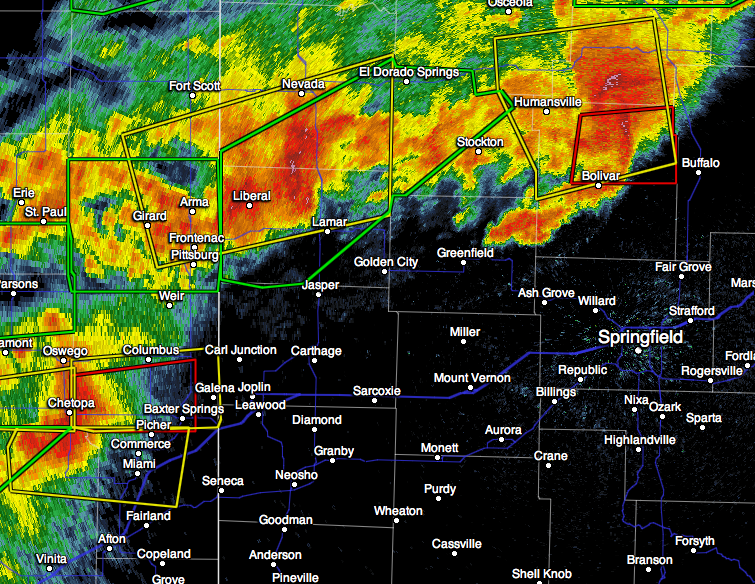 Red polygons are tornado warnings well north of Joplin. 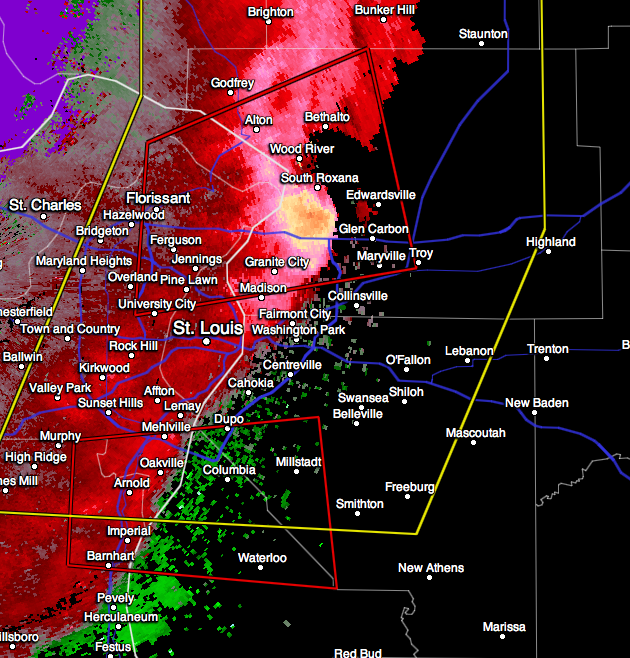 Tornado Threat NW Part of St. Louis Metro! The Weather Channel is ignoring the other tornado threats. I'm trying to keep you updated on all of them. 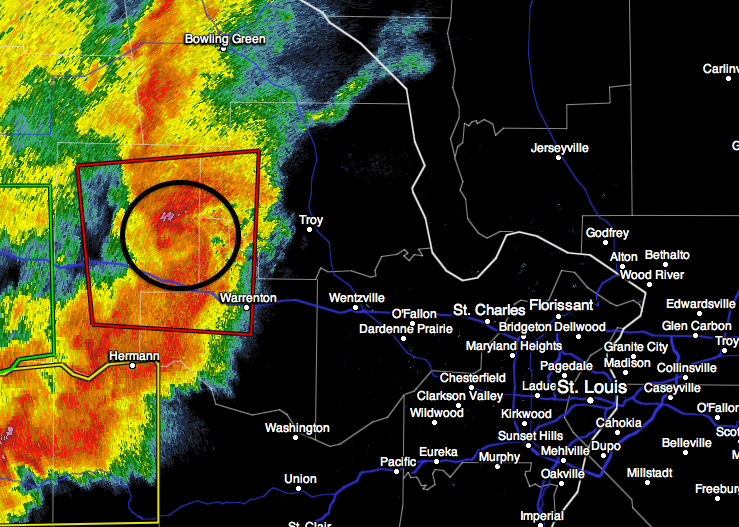 Here is a tornado indicated near Warrenton moving toward Troy, Missouri. 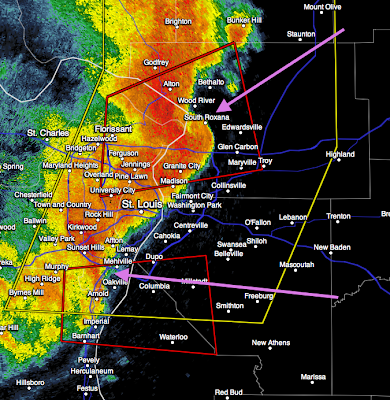 Take cover in red polygon!! There is no official tornado warning but there seems to be a tornado indicated on radar WSW of Stillwater. There may be a rain-wrapped, invisible tornado. People in the area around Stillwater should use extreme caution and be prepared to take immediate safety precautions!!! Radar 6:37pm. 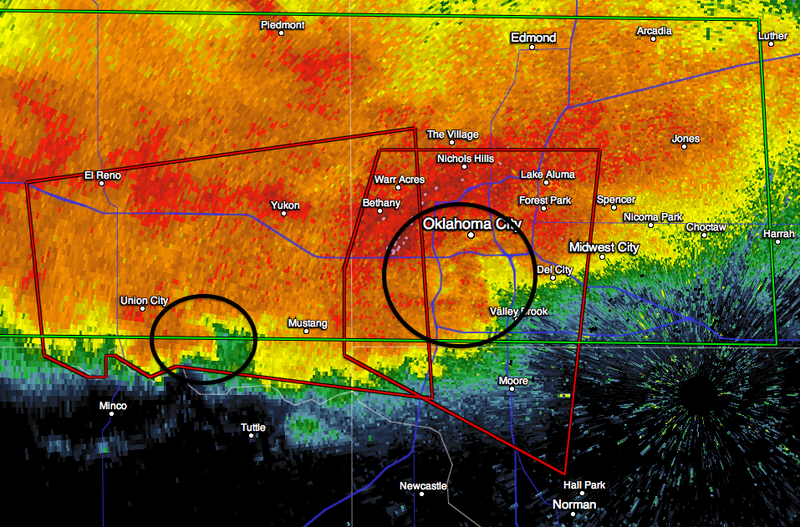 Main tornado circled in black and small tornado indicated by arrow. Probably F-5 intensity. 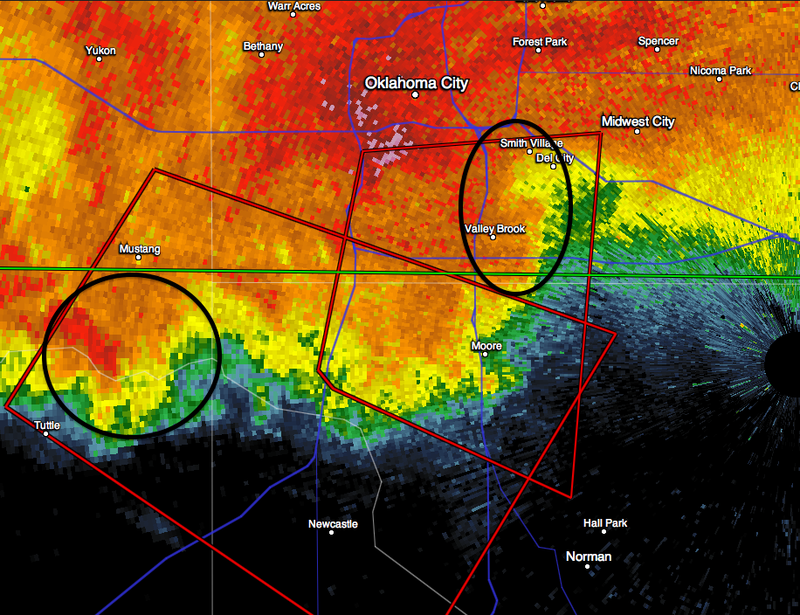 Take cover in both polygons. 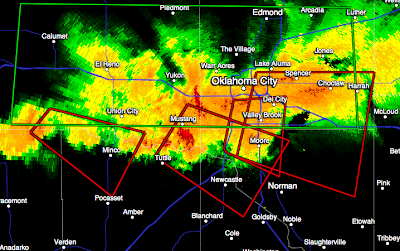 Tornadoes moving along I-40 right now and toward Yukon, Mustang, Bethany, Warr Acres, west OKC, The Village, and Will Rogers and Wiley Post Airports. 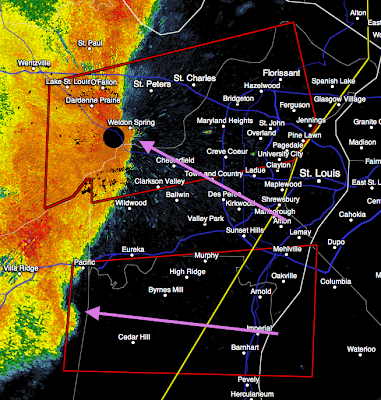 Tornado warning enlarged, see red polygons. Radar position at 6:29; tornado circled. It is moving generally east but take cover in both polygons now. 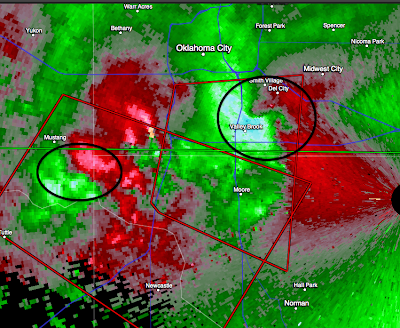 Tornado is one mile wide and violent. 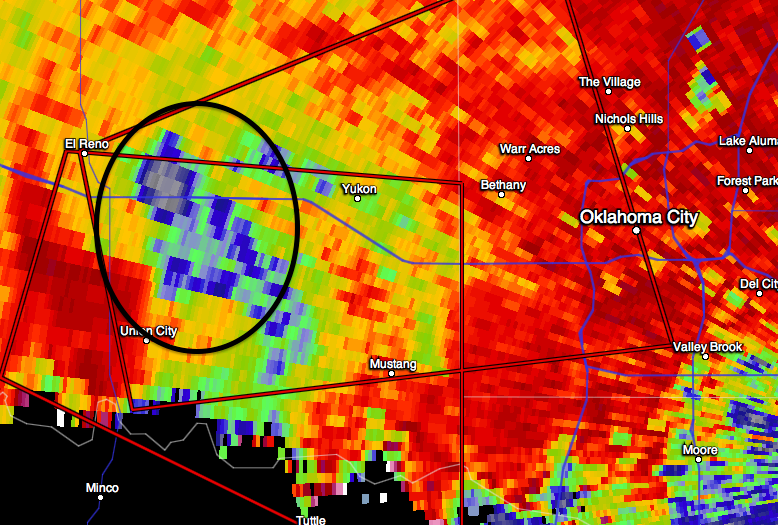 Gray is lofted debris. Lofted debris circled in black. Extreme tornado velocity, at least F-3 and likely higher intensity. Why Are We in Pratt? Don't Forget Your Outdoor Workers!